Well 2013 turned out to be a very interesting year with returns for the broader market that surprised nearly everyone. Concerns over QE, tapering, Obamacare, and other government interventions were popular news but they didn't stop capitalism from unleashing human potential. Gold and other commodities got slammed in 2013. This shouldn't take readers of this blog by surprise as I wrote about this twice in 2012 (Canada - Headed for a Crash & Canada: A Storm Brewing in China?). The most surprising thing was the rally in the markets that just wouldn't stop. The S&P 500 was up 29.6% and the Dow Jones Industrial Average was up 26.5% for the year. While many might think that a 20%+ move in the equity markets is rare, JPMorgan notes that such a move is not all that unusual. 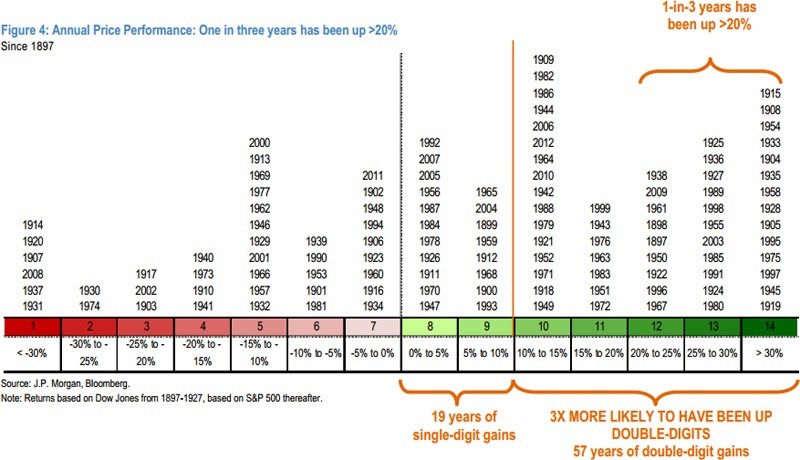 The table below groups the annual returns of the S&P 500 (and Dow prior to 1928) since 1897. What is remarkable is that one out of every three years has been up 20%, and the markets are 3x more likely to be up double digits. This years return was strong but it's not unusual. Here in Canada, the TSX Composite index was up 9.6% for the year. As already mentioned commodities got slammed this year and below is a list of the damage. I find it remarkable how oil prices have held up in 2013. US oil production has been off the charts, going up in a parabolic curve. US dependence on foreign oil fell to a 27 year low (Click Here). In 2005 the US imported 60.5% of their oil requirements and last year that fell to only 34%. This is a result of the shale oil revolution in the US where oil production is up 46.5% or 2.36 million barrels a day since 2007. If oil prices fall in 2014 that will be another significant headwind for the Canadian economy. Fellow Canadians could have benefited from the fall in commodities by not owning Canadian Dollars. Canadians who invested in the US not only realized out sized gains this year, they also realized foreign currency gains that contributed an additional 7% to their returns. So how did the stock recommendations for 2013 turn out? Well this is the third consecutive year (ever year since I started this blog) that my stock recommendations outperformed the S&P 500. 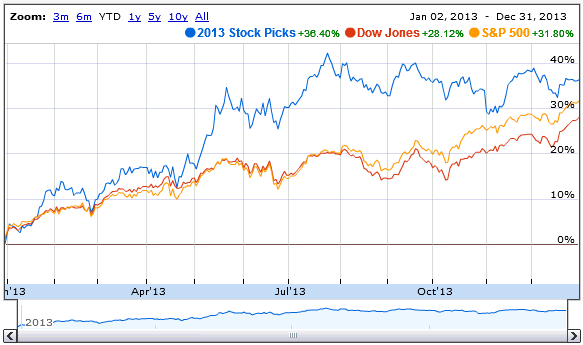 On average for 2013, they outperformed the S&P and Dow by 5-10%. They outperformed the Canadian markets by 25%. Here is the graphical performance. Looking at the graph, these picks were up 40% in August, double the market returns at that point. Of course I pick these stocks for fun and use the year end as arbitrary start and end points but much higher gains can be had for those who sell once a stock returns to its intrinsic value. As I said last year, Bank of America has been like shooting fish in a barrel. After being up 110% in 2012, it came in with another respectable 34% return, and the kicker... it's still recommended for 2014. Financials were left for dead after the financial crisis and rightly so. Nobody wanted to touch them because they didn't trust them. Today the major US financial companies are soundly capitalized and are in great shape. Berkshire Hathaway was very safe and very cheap, and remains that way. Most investors think Berkshire is too large to produce out sized returns. I disagree. Their exposure to home building is large and they their equity portfolio is poised for strong gains over the next few years. Their insurance businesses, which includes GEICO, are best in class. They consistently report underwriting profits. Berkshire is still modestly undervalued, I would estimate by 25%. Sony had some hedge fund activism that got the stock price moving. This wasn't surprising given the assets Sony owns. Similarly, Wellpoint turned in a strong result this year as well. The outlier was POSCO, which is still cheap and recommended for this year. POSCO had a tough year as steel demand was not as robust as expected. The company still sells for well under book value and is profitable because they are a low cost supplier. Demand for steel will return. For 2013 I recommended both Well Fargo and Microsoft in the Safe and Cheap category. They were indeed cheap and both outperformed the market indices last year. Downside was also very well protected. I also has some honorable mentions that should have been my top recommendations. As I mentioned all these companies had wide appreciation potential. The small energy company I didn't disclose was Rock Energy. This was because family members were purchasing this stock. It turned out to be a home run. The markets have become slim pickings over the past year, but I still believe I have some decent ideas for this year. The first two have significant upside potential. US financials are still cheap and I'm selecting two of them for this year. Finally, POSCO, a holdover from last year is still on the list. POSCO is still profitable and growing but operationally is under performing due to slack steel demand. Demand will return and perhaps 2014 will be the year. IBM is the safe and very cheap pick for this year. Last year I included this quote from the 2011 Berkshire Hathaway annual letter to shareholders. "...Today, IBM has 1.16 billion shares outstanding, of which we own about 63.9 million or 5.5%. Naturally, what happens to the company’s earnings over the next five years is of enormous importance to us. Beyond that, the company will likely spend $50 billion or so in those years to repurchase shares. Our quiz for the day: What should a long-term shareholder (in IBM stock), such as Berkshire, cheer for during that period? Charlie and I don’t expect to win many of you over to our way of thinking – we’ve observed enough human behavior to know the futility of that – but we do want you to be aware of our personal calculus. And here a confession is in order: In my early days I, too, rejoiced when the market rose. Then I read Chapter Eight of Ben Graham’s The Intelligent Investor, the chapter dealing with how investors should view fluctuations in stock prices. Immediately the scales fell from my eyes, and low prices became my friend. Picking up that book was one of the luckiest moments in my life." I couldn't agree more. The stock has languished, investors are fearful about a lack of revenue growth and cloud computing competition. IBM is one of the best run companies in the world, especially from a financial perspective. The two thirds of their revenue from Software and Services is annuity like. Earnings per share has grown by 12% annually for the past 10 years and 16% annually for the past 5 years. They generate close to $20 billion in free cash flow per year and have reduced the shares outstanding by nearly half over the past 15 years. You can call that financial engineering, heck you can call it whatever you want, but the effects are real... Revenue & earnings continue to grow on a per share basis. If you think of each share of IBM as a separate business, those businesses are doing really well at IBM. The consolidated noise is only a distraction. As I mentioned last year, be sure to do your homework on any investment. The markets are at all time highs and while that shouldn't alarm you, it should invite caution. All of these companies have wide appreciation potential but results will depend on the operating results. All of the recommended companies have short term headwinds that will clear over time. These issues and problems make for poor short term visibility. That is why they are avoided, but think like a long term owner and remember fear is your friend. Disclosure – I own BAC Class A warrants, BRK.b, WFC, MSFT, EZPW, & IBM. Will you be doing a right up on LTS? I have been watching this for a while and I think the risk reward is great here. Insiders have been buying the stock in droves. Do you plan to buy the stock? Hi Rob, I added my commentary on my selections for 2014 today. I don't plan to buy the stock for the reasons listed in the commentary.